Recreational vessels have a responsibility to stay well clear of large vessels. They are prohibited from impeding the passage of big ships in shipping channels. Big ships operate at all times of the day and night. The speed of a ship can be deceptive. It may not look like it from a distance, but they could be travelling at speeds in excess of 20 knots. Ships can weigh up to 100,000 tonnes and do not have brakes. They cannot stop or change course suddenly and will travel a long distance before stopping. Bow waves caused by a ship can swamp a small boat hundreds of metres away. Sailing vessels do not have right of way over ships restricted in their ability to manoeuvre. A ship will sound five short blasts on its whistle if it believes a smaller vessel is at risk of collision. Small vessels must take evasive action immediately. 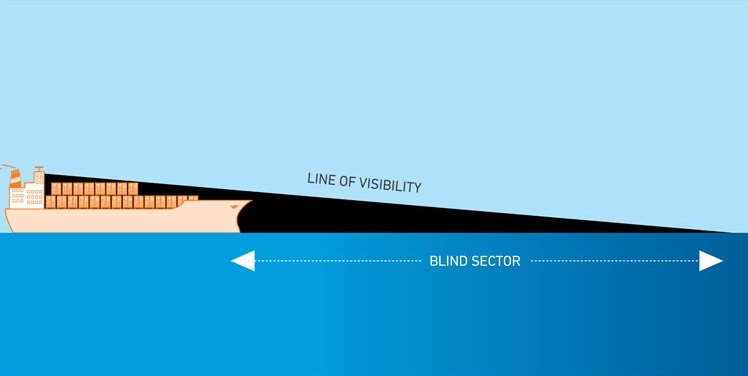 As this diagram shows, a ship's blind spot can extend for many hundreds of metres ahead. This video explains some simple rules for recreational boaters to apply to avoid collisions.